Skiers often ask us our favorite ski resorts? And we have our best family ski places in New England, Favorites out West in the Rockies, the Top Ski Resorts in Canada and the Best Places to ski in the Alps. The next ski questions is what’s the biggest ski resort in the world? Here’s our Top 10 Biggest Ski Resorts in The World! France has the world’s biggest linked ski area, Les 3 Vallées with almost 500 kilometers of skiing, we skied the three valleys last season and can attest to the alpine terrain – its awesome and spans villages ranging from chic Courchevel to less charming Les Menuires, beautiful Méribel, and high-altitude Val Thorens. 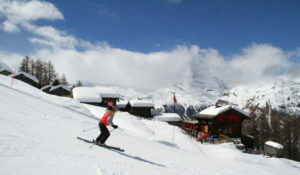 It’s huge, French and fabulous – with hundreds of on mountain chalets and tons of off-piste terrain! Where to Stay at 3 Vallées: Aman Le Melezin in Courchevel 1850, or Hotel Pashmina at Val Thorens – ask for a night in the igloo! Both these Trois Vallées ski hotels are posh, perfectly situated on the side of the slopes and you can walk to après ski or just enjoy the hotels’ amenities! La Plagne and Les Arcs are both big resorts and now they are under one massive Paradiski name with over 400 kilometers of terrain. The Vanoise Express, a double decker cable-car, connects them. Neither resort is super charming, but the skiing is vast and there’s good value staying slopeside in a 1970’s vintage condo. Both La Plagne and Les Arcs have tons of high altitude prepared slopes and some pretty wild off pistes offerings on the steeper summit terrain. 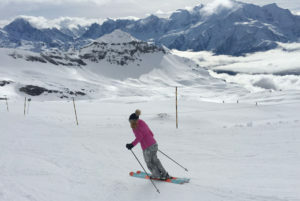 Portes du Soleil is a dozen ski villages interconnected, bordering France and Switzerland in the spectacular Dents Du Midi region, with 600 kilometers of skiing, over 200 ski lifts, 10 terrain parks and too many off-piste possibilities to list. Only down side is its lower elevation, topping out at 2,277 m.
Best Run at Porte Du Soleil: The Swiss Wall is a legendary trail at Porte Du Soleil, earn bragging rights skiing the bumps from Avoriaz France all the way to Les Crosets Switzerland! 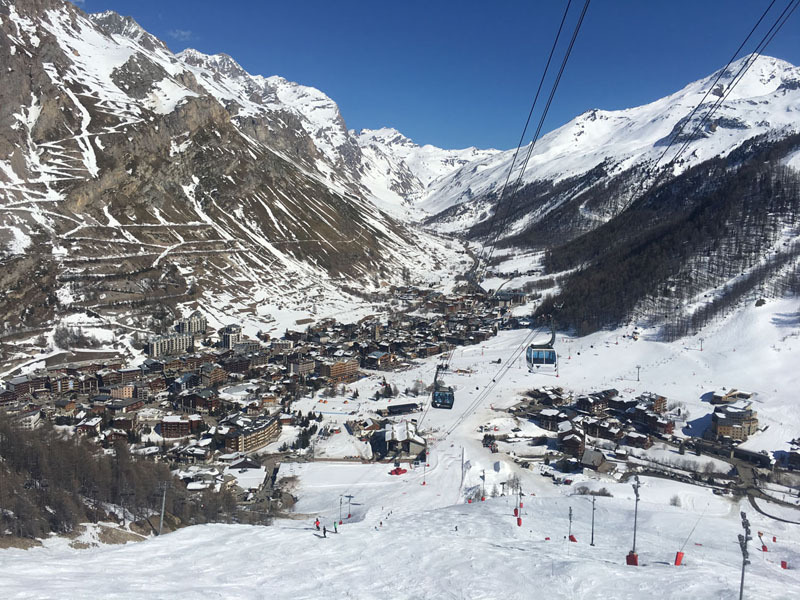 Espace Killy is the ski mega resort combining legendary Val D’Isère and Tignes with 99 lifts, 236 kilometers of prepared ski trails, and thousands of acres of off-piste terrain including several glaciers up to 10,000’. The medieval mountain village of Val Isère is charming, while Tignes is more 1970’s mod. Best Runs at Tignes & Val D’Isere: Le Face de Bellevarde above Val D’Isère is the thigh burning World Cup run back to town, scenic and steep. Ride the Olympique gondola to view the entire race course. Tignes glacier laps off La Grande Motte tram are tremendously worthy and scenic as well. 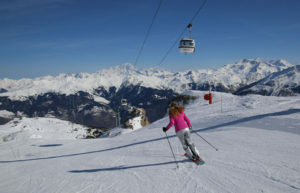 Likes its name implies, Le Grand Massif is pretty big with almost 200 kilometers of skiing, connecting five ski areas, and several ski villages Sixt Fer A Cheval to Flaine at the center, to Les Carroz, and our favorites Samoens and Morillon – the two prettiest of villages. 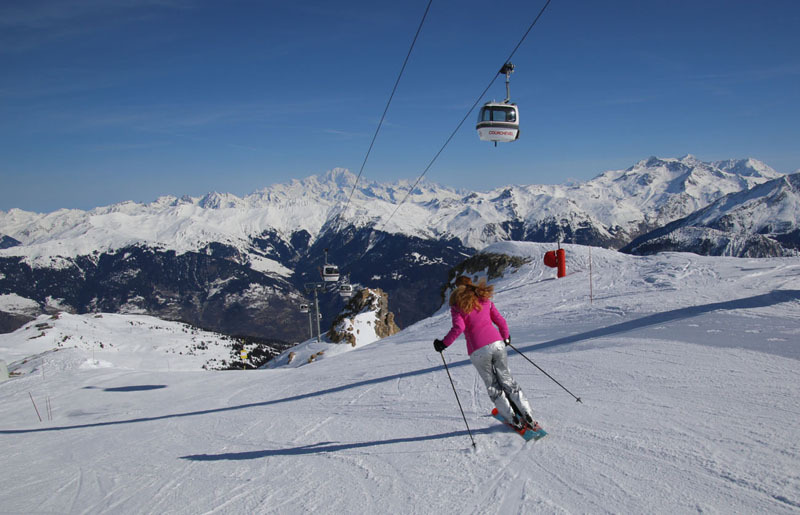 Grand Massif skiing is not grand in altitude, but it sprawls, and the views of nearby Mont Blanc from Tete Des Saix, at 2204 meters, 8,400’, are splendid. What’s Best about Grand Massif: We like the alpine charm of the historic pedestrian village of Samoens for lodging, more than the utilitarian base area of Flaine – which is more central to the skiing. Best ski to lunch is in Samoëns – La Luge à Téran and L’Igloo for traditional Savoyard cuisine and beautiful views from their terraces. 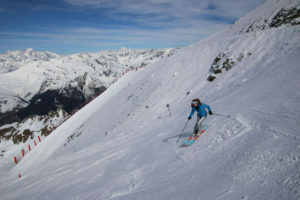 Bordering Italy and France, this huge interconnect of 7 ski resorts, called Via Lattea – or Milky Way – with 71 lifts and over 250 kilometers of trails. Sauze d’Oulx, Sestriere and Torino in Italy, and Montgenevre in France are the biggies. The Milky Way is a mix of old and new lifts, banal lodging architecture, and long runs (pistes) with lots of chalets serving delicious French and Italian food along the ski way. We love to ski Italy, or as some call it “Eataly”. Best Run at Via Lattea: Monte Fraiteve’s 2006 Olympic downhill run in Sestriere is a fame to claim. 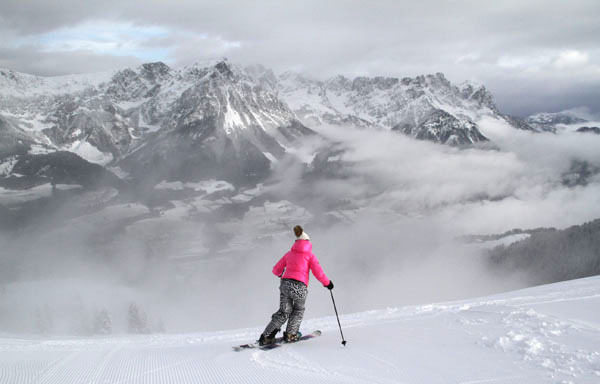 The Italian Dolomites skiing offers dramatic views and that dolce vita ski lifestyle. 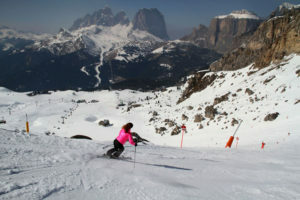 This part of Italy is home to the world’s biggest lift pass, The Dolomiti Superski pass to 450 lifts and over 1200 kilometers of pistes, not all interconnected however – it actually encompasses 12 ski regions and 45 villages! 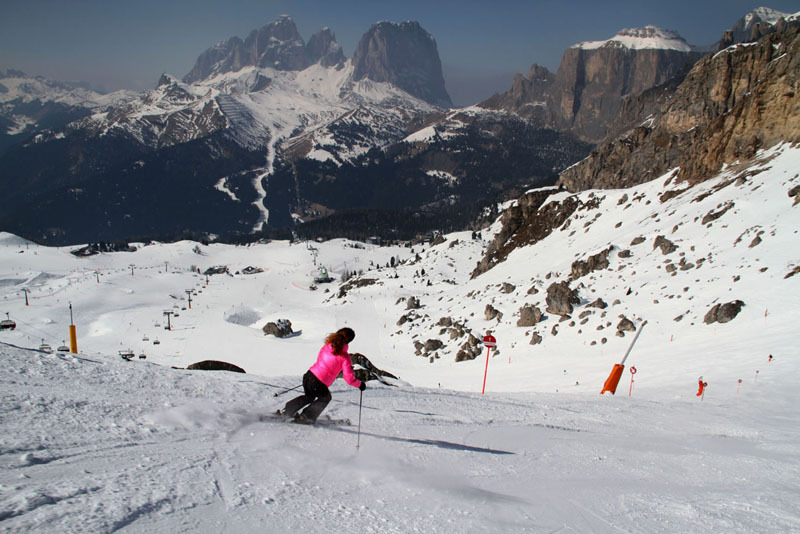 The Sellaronda is a world-famous ski tour that circles the great massif Sella, a circuit you can do in a day, with about 14 lift rides, 26 kilometers of skiing, and about 6 hours to complete the Sella Ronda. That’s not accounting for a time for a relaxing lunch at an Italian chalet on the way. The best aspect is the Marmolada cable car bringing you up to 3,296 meters, for a panorama and a long ski run down the Malga Ciapela for a whopping 2,000 meter vertical drop. Where to Stay in the Dolomites: We love the historic Italian ski towns of Cortina , Corvara, and Val Gardena. In Cortina- stay at the Hotel Cristallo, in Corvara the Hotel La Perla is posh, and in Val Gardena Ortisei – Hotel Adler is perfectly positioned near the slopes, the shops, and après ski, with a beautiful spa! Austria’s largest ski area is not St Anton on Kitzbuhel, but SkiWelt, with 90 lifts linking nine villages. It’s a great ski resort for families, with a top ski school, modern lifts, and tons of intermediate terrain, and also home to some of the best ski lifts anywhere. Best Chalet Lunch at SkiWelt: SkiWelt’s Rubezahl Alm is the most wonderful old chalet, in Ellmau, just off the slopes. This 1778 farmhouse features splendid old wood, rustic tables, a big fireplace, cowhide barstools and delicious homemade food – hasn’t changed in centuries. Skiing Zermatt is historic and huge, with high elevation terrain- up to 12,791′, 53 ski lifts, and a big bustling ski village at its base. Zermatt has an impressive 7,477’ vertical, and 153 miles of trails, plus tons of off-piste, oh and you can ski to Italy – Cervinia! We love Zermatt for the views, the terrain, the amazing lifts – trains, trams, and gondolas, and the Swiss chalets on every trail! Best Chalet at Zermatt: Hotel Cervo is right at the base of Zermatt’s ski slopes, has a rockin’ après ski scene, and beautiful alpine mod guest rooms. Whistler Blackcomb is Canada and North America’s biggest ski resort, two big mountains, Whistler at 7,160’ and Blackcomb at 7,494’ combined to bring skiers 8,171 acres of terrain, 16 alpine bowls, three glaciers, and200 kilometers of terrain, served by 37 lifts, with 5,280’ vertical. Add two lively alpine villages, and Whistler is a winter winner! Whistler Blackcomb also boasts almost 500 inches of snow annually and the one of the longest ski seasons in North America. Best Lunch at Blackcomb – Christine’s at the top of the Solar Coaster in the Rendezvous Lodge offers an amazing stable-service menu with incredible views of the steep chutes and off piste on Blackcomb Glacier. Whistler Blackcomb Bonus: If Whistler’s 8,171 acres of skiing, and wild après ski in the Village isn’t enough, there’s also Whistler Heli-skiing and Cat-skiing beyond the in-bounds and off-piste skiing. 10. In the US, the biggies are Big Sky Montana with 4,350’ vertical, 5,800 acres, 36 lifts and over 300 trails, with a summit of 11,166’. Jackson Hole Wyoming is home to 4,139′ vert from 10,465’and 3,812 acres. Vail in Colorado has 5,289 acres, 11,570′ elevation and 3,450’ vertical, with 31 lifts – mostly high speed! Park City Utah is sprawling too, at 7,300 acres, with 41 lifts. In the East, Sunday River and Killington are the big ski resorts with the most reliable conditions and longest ski seasons. See our Top Family Ski Resorts in the World!